Alibaba's quarterly revenue growth has slipped to its slowest pace in six years, a development that could dampen demand to invest in the Chinese e-commerce company's upcoming stock offering. News of the slowdown emerged Monday in a regulatory filing that provided the first update on Alibaba's performance since the company submitted paperwork in May for an initial public offering of stock. Several other updates are likely before Alibaba completes the IPO in late summer or early fall. Alibaba hasn't yet specified how many shares it will offer or how much money it hopes to raise. Analysts, though, have been predicting Alibaba could eclipse the $16 billion that Facebook Inc. fetched in the technology industry's biggest IPO two years ago. The lofty expectations riding on Alibaba's IPO may have been slightly lowered by Monday's Securities and Exchange Commission filing, which included the company's results for the first three months of the year. The numbers revealed that Alibaba's first-quarter revenue rose 39 percent from last year to roughly $1.9 billion, based on the current exchange rates for the yuan. Although that represents robust growth for most companies, it's a significant deceleration for Alibaba Group Holding Ltd. and a network of websites that includes Taobao and Tmall. For instance, the company's revenue surged by 62 percent during the final three months of last year. The first-quarter growth also marked the first time that Alibaba has posted a quarterly revenue increase below 40 percent since Yahoo Inc., one of its major shareholders, began disclosing its results in 2008. Signaling investors' disappointment with Alibaba's first-quarter performance, Yahoo's stock fell $2.13 , or nearly 6 percent, to close Monday at $34.81. Yahoo's fortunes are closely tied with Alibaba because it owns roughly 23 percent of the Chinese company. As part of Alibaba's IPO, Yahoo will get a multibillion-dollar windfall by selling 208 million of its Alibaba shares. Yahoo will retain ownership of another 315 million Alibaba shares, or about 14 percent of the company. The downturn in Yahoo's stock indicates that some investors are betting the company won't make as much money off the Alibaba IPO as previously thought. Alibaba is still highly profitable, so much so that it makes more than Amazon.com Inc. and eBay combined. In its fiscal year ending in March, Alibaba earned $3.7 billion on revenue of $8.4 billion. Amazon and eBay earned a combined $3.2 billion on revenue of nearly $95 billion during the same period. 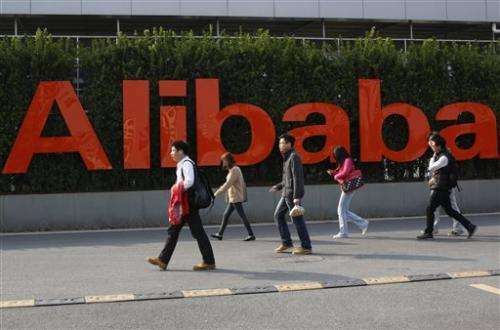 Besides detailing its latest financial results, Alibaba also disclosed that the company's strategy will be controlled by a partnership consisting of 27 members, including 22 people from its management team. The partnership includes Alibaba co-founder Jack Ma, now the company's executive chairman, and CEO Jonathan Zhaoxi. Alibaba also revealed that Yahoo co-founder Jerry Yang will be re-joining its board after a two-year absence. Yang joined Alibaba's board in 2005 after negotiating Yahoo's $1 billion investment in the company. He stepped down in 2012 when he quit Yahoo, too. Yahoo's representative on Alibaba's board, Jacqueline Reses, will resign once the IPO is completed. Yahoo and another major Alibaba shareholder, SoftBank, are expected to agree to back directors selected by Alibaba's controlling partnership, according to Monday's filing.